As I posted the piece about Trey Ganem and the custom caskets, I thought about an instance where 5 kids were killed in a fire and a gentlemen custom built caskets for each child. I thought that was a WONDERFUL gesture and I wanted to highlight his good deed. Doggone it, it was Trey Ganem. – KUDOS TO YOU, SIR – B.D. Former hot rod designer turned casket designer Trey Ganem has donated custom coffins to the family who lost five children in a house fire in Edna last week. Ganem, an Edna resident, knows the family and was asked by a family member to make the caskets. He built all five in four days. He started at 5:30pm Wednesday, and aside from a few hours to sleep and some time on Thanksgiving, he worked through Saturday at 2:00pm. The five caskets are customized for each child. 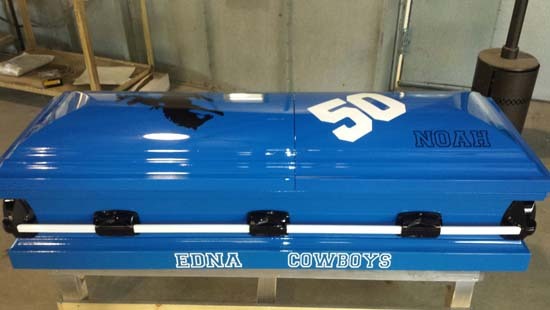 For 15-year-old Noah Ortiz, Ganem designed a casket with his football team colors and his number. His football helmet will be fixed onto the casket. 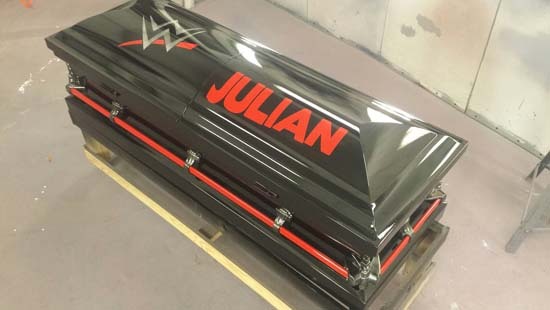 The casket for Julian Ortiz, 11, has a WWE theme. 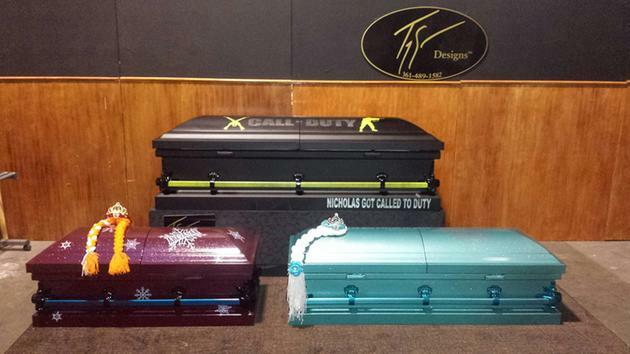 For Nicholas Ortiz, 13, Ganem designed a casket with a Call of Duty video game theme. The coffins for Lilyana Hernandez, 6, and Areyanah Hernandez, 5, are painted with a “Frozen” movie theme. Ganem is donating his time and materials, and was originally only going to do it at cost, but the community has stepped in and these will be presented to the family at no cost. Ganem told us the hardest part of this endeavor was when the family came in to watch him work. He says he hopes these caskets will allow family to have a happy thought of their loved ones.